Thanks to a kind donation by the Custer/Nugent Foundation, the Solid Waste Management District opened the Little Red School House Waste Exchange. 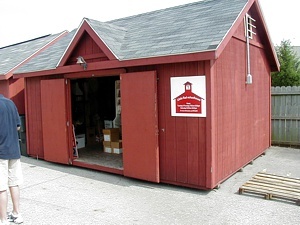 The exchange, located behind the Columbus/Bartholomew Recycling Center, is open to any not-for-profit group Tuesday - Saturday from 7:30 a.m. - 4:30 p.m.
A wide variety of materials are available, at no cost, that would benefit Arts and Crafts Departments and Home-School Teachers the most. The only thing we ask of you is that you inform your class that the materials are reused items that would have been discarded. Reusing these materials saves natural resources, electricity and prevents pollution. Coffee cans of all sizes with lids. Baby food jars with lids. Potato chip canisters, with and without lids. Containers of all shapes and sizes. Gift wrap, paper towel and toilet paper tubes. All types of greeting cards. New & used. Cardboard, paperboard sheets and paper sacks of all sizes. Egg cartons, cardboard and foam. Polystyrene blocks of all sizes and shapes. Pencils, crayons, rubber bands and many other classroom supplies. National Geographic magazines dating back to the 1920's to current. School books, encyclopedias and other reading material. Shoe boxes of all sizes. Outdated computer equipment and printers. Assorted other materials that would benefit your classroom. Many items come and go so if you don't see what you want, check back the next week and we may have it in stock.